After Stalin's crackdowns were over, the USSR was a lot less hostile to religion than Americans are often taught. Illustration by Alex Cherry. 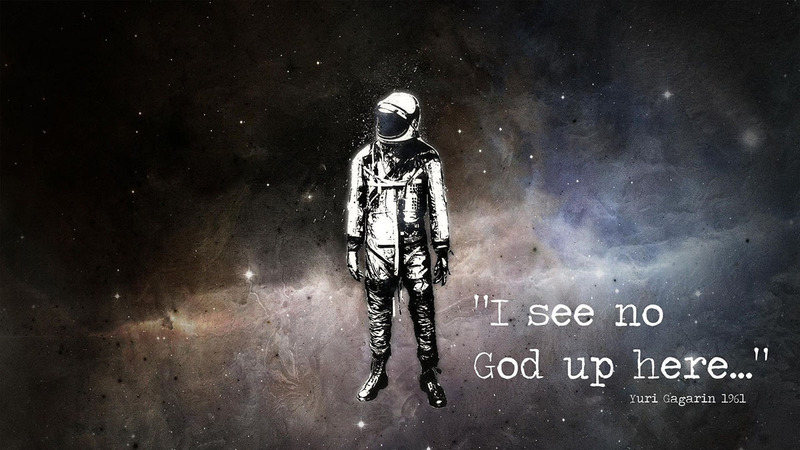 While this quote is often attributed to Gagarin, it’s really from a speech by Nikita Khrushchev, who said “Gagarin few into space and saw no god up there.” Gagarin was a member of the Russian Orthodox Church. Maybe it’s just me, but it seems that more and more blogs are starting to post detailed accounts of someone leaving religion and embracing atheism. With surveys showing that the fastest growing belief systems in the United States is actually a lack of belief in the supernatural and the rejection of theistic worldviews, one could say that we’re seeing atheists feeling emboldened and revealing themselves to the world. Atheists are leaving the closet, starting internet communities and trying to advertise on buses and billboards that they’re not crazy or in denial because they reject a supernatural deity for which there’s no proof and that they’re not alone. For a person doubting the faith he grew up with, it’s now a perfectly viable option to become an atheist and try to find answers to existential questions through science and education after announcing his intention to the world. It’s a post that I will never be able to make. As long time readers of Weird Things may recall, I was born in the former USSR where religious institutions were corralled by the government to ensure that a powerful church wouldn’t start grooming political figures to compete with the nation’s leaders. By the time of the Soviet Union, the Orthodox Church had been a major institution for almost a thousand years. If the priests tried to organize any kind of mass resistance to the regime, they would’ve had no shortage of faithful followers less concerned about the material goods offered by the Communist Party than their spiritual fiber. Knowing that it would never be possible to eliminate religious organizations and was actually likely to backfire, the Soviet leaders started to downplay the role of religion in peoples’ lives. Interestingly enough, the campaign to de-emphasize religion was relatively subtle. Churches were open and there was a law declaring that all religions which weren’t considered to be dangerous cults (read: advocated resistance to the government or its policies), were free to practice as they wish. Seminaries were open to any would be priest or rabbi. However, being deeply religious carried with it a veiled social stigma. It might hurt a budding career because you weren’t considered to have your feet firmly enough on the ground. You would get some resistance in politics because your devotion should have been to your work in the party rather than your church. And all college students attended a class called Scientific Atheism which outlined a case for disbelief. On the other side of the world, priests in the United States used the growing indifference of the Soviet public to religion as a tool for proselytizing and motivating the government to put religious references on court buildings and money. They promoted a belief in God as integral to what it means to be an American and that religiosity was a bulwark against the evil, godless Reds. We can trace the chants that America is a Christian nation and true Americans are God-fearing people back to the Cold War and the Red Scares. No wonder atheists stayed in the shadows for so long. Their lack of belief was being tied to an enemy state with a nuclear arsenal poised to destroy their nation at any moment. Of course in the USSR, people saw the ideological conflict with the U.S. as a case of establishing who would control the world and shape it in its image. Religion had nothing to do with it. And it was in this world that I was born. Growing up, there was no religious indoctrination. Churches were examples of artwork and architecture rather than direct links to a higher power. There was no serious interest in spreading religion or making sure you were “saved” and believed in the right thing in order to go to heaven. Atheism was considered a perfectly normal way of thinking and a sizable percentage of the nation were atheists. For me there was never anything to really reject or embrace. I experimented with learning about religious beliefs and trying them on for size, but found that nothing really answered any of the big questions in an objective, factual way. The only way to solve them, I decided, was to find out through research and experimentation. update 06.08.2009 — please note that this post is solely a short summary of some of my experiences of living in the Soviet Union and relates to the freedom of religion laws and a de-emphasizing campaign of the 1970s and 1980s, long after the political repressions which affected numerous religious communities were over by the mid 1950s. In no way do I condone anything the Soviet Union has done or advocate any of its activities as was grossly misrepresented on several blogs which have linked to this post. I realize that I should have done a better job during editing and that may be a source of some confusion, but this post was supposed to be just a quick and random reflection on why I grew up without strong religious beliefs and nothing more.